It promises a lifestyle where residents can easily walk to their workplaces, schools, churches, restaurants, parks, shops, service providers, fitness clubs, and entertainment venues from their front doors. Large porches become meeting grounds for neighbors and the homes are built in classic 1920s/1930s styles. As we discuss on this episode of our Custom Builder Podcast series, “It really is a lifestyle that folks are buying into when they come to Norton Commons.” Don’t let the small lot size deter you. Most people find a private patio and manageable yard is plenty big enough, given all the public park land and green space available nearby. Buying in this elite neighborhood gets you a home with enduring curb appeal that houses the latest trends, efficiencies, and features you could ever desire. Builders must go through a lengthy interview process to be approved for work in Norton Commons. Even after approval, every little design detail is scrutinized. We have learned some things the hard way! 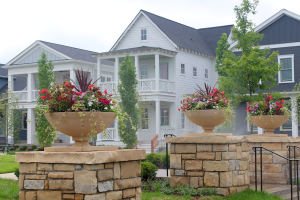 Norton Commons was a featured neighborhood for the 2016 Homearama, which brought a lot of notoriety. 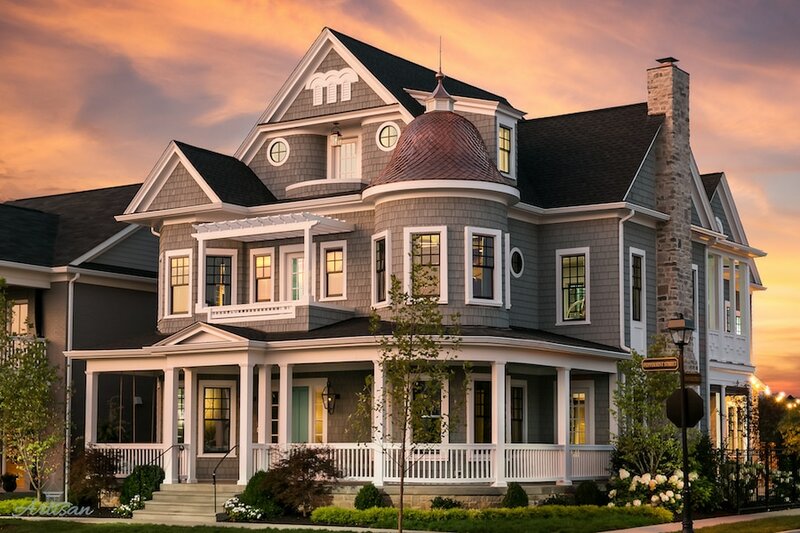 If you want a custom build here, you can choose from Classical Vernacular, Italianate, Craftsman, Arts & Craft, or Colonial. In addition to custom homes (which are more affordable than you may think! ), we also build move-in-ready spec homes. You can live, work, eat, shop, worship, learn, and be entertained without ever needing to leave the neighborhood! Builders are held to a higher standard to maintain a cohesive look and feel, and guarantee rising property values. Business owners love being part of the close-knit community. There is a supportive business community down Meeting Street and around the Town Center. The entrepreneurs who live here appreciate the convenience and culture of Norton Commons. 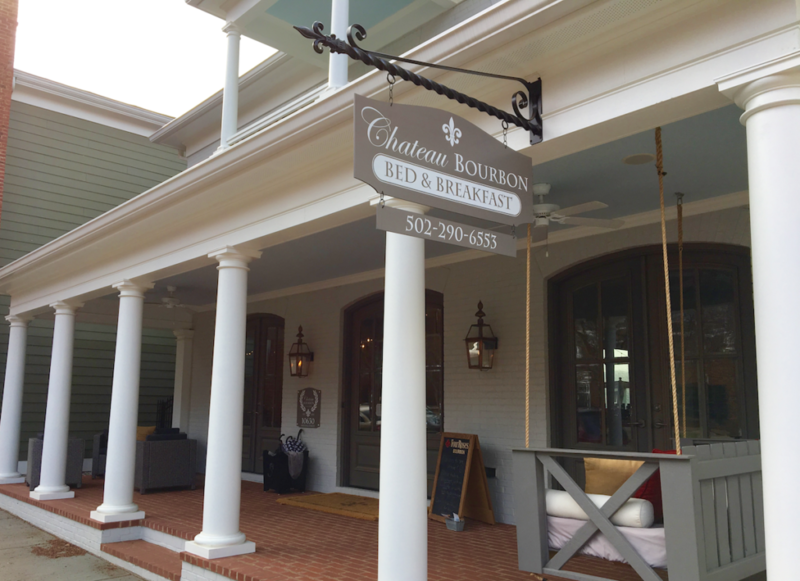 Missy Hillock, owner of Chateau Bourbon B&B, loves chatting with neighbors on her front porch, walking to the lake, enjoying the green space, and all the service providers within walking distance. Gretchen Black co-owns the Lulubelle’s boutique with her cousin and says “We love the idea of building our business in a convenient place where both of us live.” “We love the other businesses around. We love the support.” Many of her customers have come to “make a day” of their trip to Norton Commons – dining and hitting all the unique shops. We’re really blessed to be a part of this great community. If the Norton Commons lifestyle sounds like something you might be interested, you can learn more at ArtisanSignatureHomes.com or follow us on Instagram @ArtisanSignatureHomes. Contact us directly for a tour of any of our spec homes or to discuss your vision. Welcome to the Custom Home Builder podcast series, the show for people who enjoy the home design and construction process. If you’re looking for your next builder right now or hoping to build your dream home in a few years, our Custom Home Builder podcast is the show that answers all of your questions, as we pick the minds of experts to ensure your luxury home building process is as smooth and enjoyable as possible. To get the full experience, make sure to visit ArtisanSignatureHomes.com. You’ll get access to all sorts of beautiful pictures detailing the entire process of building your own custom home, plus access to our full podcast library. For our Instagrammers, you can find us at @ArtisanSignatureHomes on Instagram. We try to share a new picture from one of our projects almost every day, so check us out. Greg: Hey there, everyone. Welcome to another episode of the Custom Home Builder podcast with Jason Black, the president and owner of Artisan Signature Homes, Louisville’s best-known and most accomplished custom and luxury home builder. Jason, good to see you. How are you today? Jason: Greg, I’m doing well. It’s a beautiful morning here in Norton Commons. Greg: It is, and Norton Commons is exactly what I wanted to talk about. You’ve referred to it so many times over the past … I guess you’ve been doing your podcast for well over a year now and you’re a big believer, but I was hoping we could maybe get into a little bit more detail about the neighborhood and explain to listeners exactly why it’s so attractive to everyone. Jason: Yeah, so Norton Commons is … really it’s almost a 600-acre building site, and you think about developments these days, that’s a pretty large development. When they set out to do the design, they wanted to bring in an expert, so they brought in a company out of Miami who is called DPZ. It’s Duany Plater-Zyberk, and they did towns like Seaside, Rosemary Beach and some of the more famous TND, or traditional neighborhood designs. Greg: This was quite a few years ago, right? Jason: Right, we’ve been building in Norton Commons for probably 10 years now, so I’m going to guess it’s almost been probably 20 years ago they started laying the groundwork for Norton Commons. Greg: You mentioned Seaside. That’s the neighborhood in “The Truman Show,” right? Jason: That’s right. That’s right. It’s down kind of outside of Destin in Florida, in the panhandle. Greg: Okay, so a long time ago, this got started? Jason: Yeah, and so the concept was to create almost a neighborhood within a larger metropolitan area of Louisville, but the thought is put everything in the neighborhood, so if you’re living in the neighborhood, you don’t really have to leave. Norton Commons is a little different from some of the other TNDs in that the actual center of the neighborhood is the Town center, so we’ve got a Meeting Street and you’ve got all the businesses, all the restaurants. Greg: How does that make this different? You said that Norton Commons was different, that it had a business center or a town center. Do some of the other … you’re calling them TND neighborhoods … do they not have that? Jason: It’s very difficult to get a business to thrive in a TND, just because sometimes you almost have to build all the houses first, then bring in the businesses. Some of the TNDs, the businesses may be on the outside or one of the last sections or something like that. Well, Norton Commons came first with some of the businesses. Karem’s was one of the first. I think it was the first restaurant to open on Norton Commons Boulevard, and they’ve been here from the get-go. Then it’s just kind of evolved from there, and businesses have always come to Norton Commons really before the residents. There may have been a couple hundred residents, but now we’re well over I think a thousand residents. There’s … I don’t know the count … seven, eight restaurants, maybe more, multiple retail spots. You’ve got law firms, you’ve got a dentist, so you name it. There’s schools here. There’s actually a new YMCA and there’s two schools. There’s an elementary school and then there’s a Catholic school that goes kindergarten through 8th grade, all part of creating that community in a community in Norton Commons. Greg: This is something you’ve touched on frequently in your podcast series, is the lifestyle and the business choices that people have. You were talking about some restaurants. There are several right across the street from where we’re recording right now. I think as I drive through I see some health clubs, right, so yoga or something? Jason: Yeah, you’ve got a Core Pilates and a couple fitness places as well. Greg: Then you also have things that aren’t really businesses but are part of the community. There’s a dog park, and you mentioned the Town center. There are events at the Town center, correct? Jason: Yeah. There’s a lawn. Sometimes they’ll have movies on the lawn in the summer. They’ll have sundown street parties where they’ll close some of the streets down, and then a little bit further down Meeting Street there’s an oval park that’s several acres of just dedicated green space. Almost all the neighborhood revolves around this egg or oval park area, and there’s even kind of a … an arm off of it is a great big amphitheater that’s kind of nestled down, sits behind a lake, a beautiful backdrop. You’ve got some cool two-story homes that line the amphitheater and look down, and they have concerts all throughout the summer. It’s growing in popularity, so it was designed, again, for Norton Commons residents, but it draws. Word travels, so friends of friends come. You know, some of the last parties this past fall they had, there were several thousand people, and that’s again part of the goal, is to get people introduced to Norton Commons that maybe thought, “Well, I couldn’t live in a neighborhood where the houses are that close together,” but as most people find, they don’t really need a large yard. There’s tons of green space that you can take advantage of, and it’s not necessary for day-to-day living. Greg: It’s a different way of thinking about yard, I guess, or green space, in that I don’t have to have my own half-acre lot that I go out and mow to have green space to use. If people think of the shared space they get, they don’t directly pay for it when they buy a house or build a house with you, but it’s part of the community, right? They get access to it, even though they don’t have to maintain it. It’s just a different way of thinking about it. Jason: Yeah. Instead of having a half acre in your backyard… You know, I’m a resident, I live in Norton Commons. I built in here for seven or eight years before it finally dawned on me that, hey, I should be living here. I don’t have a patch of green space in my yard, but I’ve got three kids and two dogs and we live right across the street from … I bet I’ve got access to 30 or 40 acres of green space right outside my front door. I think, once people get over the fact that they don’t have to have grass in their backyard, that they can take advantage of the green space, most people will end up saying to me, “Gosh, I know I told you how much green space I needed when I built my house in Norton Commons. I didn’t really need that much. As long as we’ve got a little patio, some privacy in the back, we spend more of our time on the front porch.” It really is a lifestyle that folks are buying into when they come to Norton Commons. Greg: Okay. Jason was just talking about lifestyle and Norton Commons, and we have Missy with us, who is the owner of Chateau Bourbon, next door actually. Missy, I wanted to ask you what you thought about Norton Commons and why your business is here, and why you chose to move here personally? Missy: Well, we decided to move here primarily because of the location. My husband and I were looking for an East End location, and we hadn’t heard of Norton Commons before. When we drove into the neighborhood, we were just blown away, and even at that point when we decided to build, we had no idea of all the things that it was going to afford us in terms of our lifestyle. We loved the front porch aspect. We like to be social and to be able to sit out and chat with neighbors. We love the idea of the green space, that we don’t have the maintenance, but we get to enjoy. Being able to walk and being able to see the lake and some of the gardens, we really enjoy it, and of course having all of the businesses right at our fingertips. We now have our physician, our dermatologist, our dentist, all within just a couple of blocks away, which is really great. Greg: Does that happen a lot, that people come? Maybe they’re looking at Norton Commons homes or they’ve heard about Norton Commons, and they give you a call and they want to spend a night or two nights and look around the neighborhood? Or they just happen to find you, either way, and it turns out to be a great combination for you? Missy: Yes, absolutely. All of the above. It’s also great too for those who do live in Norton Commons who have family or friends coming into town and they may not have space to host the guests. They love the confidence in being able to send them to the B&B and know that their friends and family are going to have a great overnight stay and experience. As a matter of fact, the neighbors usually want to come down and hang out at the B&B. Instead of hanging out at their house, they want to come hang at the B&B, so it works out great. Greg: Just real quickly, when you were thinking about starting your business … I know you’d lived here for a few years before you started your business … did you look in other parts of town, or is this something you believed would only work the way you had envisioned it here in Norton Commons? Missy: It was that we wanted to do it here in Norton Commons. We knew not only would it be a great spot because of the visual aspect of the type of architecture that we wanted to have in the new construction, but that it was such a need within Norton Commons because there’s no other lodging options at this time. Greg: Okay. I want to talk a little bit more about why you chose to build here, live here, but you were talking about the history of Norton Commons. Before we talk about why you wanted to build in Norton Commons, I’ve heard you talk before about sort of the architectural standards, and that it wasn’t just a commercial idea, “Let’s put up a large subdivision where the developers can make a boatload of money.” There was some real artistry and long-term decision-making that had to go into place, and with a project this big, they had to be bankrolled in such a way to make sure that they could withstand the ups and downs of the market. As it so happens, there was a substantial down in the market during some of the first few years of Norton Commons, and I think I’ve heard you say that that’s part of the real attraction to you is some of that artistry, some of that forethought, some of that real stability. Jason: Yeah. When Norton Commons first started, I was immediately drawn to the architecture. There’s only a few, there’s probably five architectural styles that are allowed to be built in Norton Commons, and so you have anything from a Classical Vernacular house to an Italianate house to a Craftsman-style house or Arts and Craft, or a Colonial. Then there are some options, that maybe 5 percent or less of the homes can be a Spice Style, so you still have to have proper architecture but can break the rules a little bit. It’s kind of how architecture evolves, from style to style, but a lot of those styles or patterns are homes that were built in Louisville in the 1920s and ’30s. That’s really what we were … you know, when DPZ put the pattern book together as what builders have to go by, they modeled it off these old styles. What it is, you know, all the alleys, or all the garages to the homes are in the back of the house. When you’re driving down the street, you don’t see big garage doors and cars facing you that are parked in tons of concrete space. It’s all in the back, so people sometimes can’t put their finger on why they are drawn to a place like Norton Commons, but it’s the tree-lined streets that, you know, really welcome you, and all the porches. You can’t just have a two-foot-wide porch. There’s minimum requirements when we build porches that they need to be at least eight foot deep, sometimes ten, just to make sure you can utilize the porch and have room for furniture and maybe even a couch out there or a swing. Part of that style and that comfort is what drew me to Norton Commons. I’ve always been an architecture buff and just loved good architecture and thought, “Gosh, I want to be a part of that.” Because when the neighborhood came into existence, I wasn’t a builder in here, so it took me a while to get approved and get in the process. They went through a lengthy interview process, and wanted to make sure we were a good fit for the Builders Guild. I guess the neighborhood was maybe two or three or four years in before we joined, so we’ve been building in here since I think 2007, so going on 10 years now. Greg: It sounds like they … they being Norton Commons … wouldn’t accept say a brand-new builder. You had to have a little body of work, or a big body of work, to show that you knew what you were doing, you could hold to the architectural standards, you were able to bankroll yourself, and really they’re looking for a certain kind of builder. Jason: Yeah, and you can’t come in here and just build one house, because it’s such a … it’s a difficult place to build because if you don’t build right, there’s somebody knocking on your shoulder and saying, “Hey, look, that detail’s wrong,” or, “You didn’t trim your windows right. You’ve got to rip out the brick and redo it.” You know, unfortunately, I’ve learned those mistakes. I’ve taken out brick, I’ve moved windows, I’ve put the wrong trim on, and it’s a learning curve. Greg: They’re 20 years in now, or somewhere around there. Do they still have someone on staff that goes around and looks at minutiae? Greg: That’s out of your pocket? Jason: Yeah. You’ve got to fix it. It’s sometimes not a pretty picture. Greg: They changed the rules? Jason: They changed the rules and they just let people build whatever, just because they were happy people were building. Norton Commons stayed tried and true to their style. Maybe the houses got a little bit smaller, but the details remain the details and they’ve never wavered from that. I think that’s one of the parts that’s made this place so successful over time. Greg: What I found interesting, and actually was very illuminating for me, was to listen to you talk to a couple of your fellow builders who were in from out of town, so custom home builders from different markets, and they sounded jealous about Norton Commons and how tight they’ve been with the standards, and that there has been no change and how much forethought, it’s difficult to do, it sounds like, what they’ve done here at Norton Commons. Jason: It really is, and unfortunately they’re not … you know, if you break the rules or do something that you’re not supposed to, you can’t talk your way out of it, you know? I’ve tried, trust me. You know, it’s like, “Jason, you’ve got a pattern book. You know that you’ve got to have this window with this Classical Vernacular style, and you can only have these doors.” You’ve got to stick to that, and if you want to vary from it, they … you can get variances, but again you have to get those approved. Usually it’s if you show historical precedent, so if you find some photographs or some houses that were built in the time that this neighborhood was modeled after, you have a chance. If you just did something because you thought it was cool, then you’re going to have to rip it out and do it the right way. Greg: Can you give me an example? You’re talking about Vernacular. Does that mean that a certain style window should be paired with a certain style door? Jason: Yeah. For example, you know, in traditional suburbia, a lot of people like, I’m going to say like these double iron doors that are really heavy and really massive. 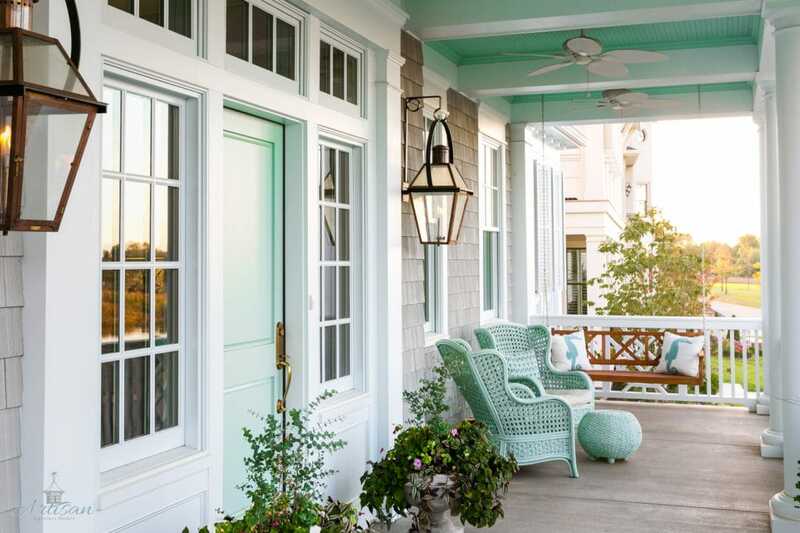 They might look cool on a big house out in suburbia, but you put it on a Classical Vernacular house that’s all siding, with white windows and overhangs, something out of the pages of “Southern Living,” it just doesn’t match having a big iron door. Greg: Okay. We’re talking about housing, why don’t we stick with that real quickly. I think you mentioned a couple of different house styles. What have you noticed over the years that you’ve been here about values? It doesn’t feel like a neighborhood that’s struggling. It seems to be doing pretty well. They just had Homearama here in 2016. They’ve started on another section. There are two more sections to go. This seems to be a place where people are happy and people are looking, and they’re going to be building for years to come. Jason: Yeah. I’ve had the opportunity to be building in here for quite a while. I’ve built … I’ve lost track now, but it’s well over a hundred custom homes in Norton Commons. When my previous homeowners have gone to put their houses up for sale, the earlier in the process that I built them, the more return they’ve seen on their investment, because each section … so they’ll … we try to build a section at a time, and usually that section’s going to be anywhere from maybe 30 or 40 to 70 lots at most. We want to build that section, build it out, let you live through construction for maybe a year or two, and then move on to the next section. Greg: Everyone in that section’s doing it at the same time? Jason: That’s right, so you grit and bear it for a year or two and then your section’s done, and then it moves on to another section. Every section that comes on, or every new phase, the lot prices continue to go up. The first of the year has come and gone and all the vendors have hit up for their price increases, and the same with the developer. It becomes more and more expensive, you know, as costs go up, so the lot prices continue to go up. The cost to build a house continues to go up, so houses are more valuable. They’re worth more money because people like newer houses and the newer houses tend to appreciate. It’s kind of fun to see it, and they’ll end up … you know, it does cost a little bit more to build, but you’re getting the newer technologies, you’re getting the newer products, and really you’re going to get a newer house with probably more efficiencies as well. Greg: It sounds like Norton Commons is now big enough that there’s a buying crowd for both existing homes and new homes, and some of these people need to sort themselves out. They aren’t sure what they are. Some people are moving to town and they need a home tomorrow, and other people live two subdivisions down and they can work with you for a year and get it done. It does seem to be sort of that destination community that is attracting a lot of different kinds of people. Jason: Yeah. We have a variety of homes. We build a lot of custom homes where somebody comes to us, doesn’t know exactly what they want. We’ll help design it, we’ll build it, and then we also like to have several market homes or spec homes available. Louisville is a growing community, lots of jobs in here. We’ve got UPS pilots, we’ve got a huge hospital and health care population, and people are coming in, transferring all the time and need a place, and they want to buy now and they just don’t have time to build. We like to have some spec home availability for them. Greg: There are even a couple businesses, the businesses you talked about earlier, some of the restaurants. Those seem to be mom-and-pops, which I love. I’m not complaining at all, but there are some larger businesses that have national headquarters, and they chose Norton Commons. Jason: That’s right. Several of our clients that we’ve built for, actually I’ve built businesses for, or maybe I didn’t build the business but they chose to relocate their business here. One of our neighbors here, we’re located on Meeting Street. We just decided to build an office for Artisan, so we’re just opening the doors, but we’re right next door to Chateau Bourbon, a bed-and-breakfast, and she happens to live here in Norton Commons. I’m surrounded on the other side by my wife’s business, Lulubelle’s. She’s got her boutique next door as well. Greg: All right, so I’m going to interrupt now. Jason was talking about some of the businesses here in Norton Commons and he mentioned his wife, Gretchen, who just sneaked into the podcast studio here. Maybe “snuck in” is the right word. Gretchen, good to see you. How are you? Gretchen: I’m doing well, thank you. Greg: You have a business. It’s actually right next door here in Norton Commons, so do you want to tell us a little bit about your business and why Norton Commons seems to be the right place for you? Gretchen: Sure. Yeah, I’m right next door, and our business is called Lulubelle’s. We are a locally-owned boutique, and it’s my cousin Natalie and I. We co-own the business together. Our moms are sisters, and we’ve grown up together. She’s like a sister to me. This has kind of been a childhood dream of both of ours since we were young little girls. So why we chose Norton Commons is because we love the community, we love the idea of building our business in a place where both of us live in this area, so it’s very convenient for us to have a business close to home, and we love the other local businesses around. We love the support that we give to each other, the other boutiques and shops, and even dentist offices, and our pediatrician is in this subdivision too, which makes it convenient and nice. Greg: That’s kind of funny. Are there enough businesses here now that you find that there’s people just walking around, maybe going to a boutique and then maybe to lunch, and then going back out and doing a little shopping? Gretchen: Yes, especially over the holidays. I found that we had visitors coming from different parts of Indiana that had heard about Norton Commons and kind of made it a destination, Saturday afternoon trip. What they did, they came in, they had lunch at one of the local restaurants, and then they shopped the boutiques in the area. Greg: Perfect. Well, thanks for sneaking over for a couple of minutes. I know you have to get back to Lulubelle’s, but good talking to you. I’m always interested why people have chosen to set up shop here in Norton Commons. Gretchen: Thanks so much for having me. Greg: Yeah, so before I let you go, there’s one more kind of property I want to talk about which I know you build, is mixed-use, which is really what Norton Commons … they got a lot of publicity in the beginning for it. I guess they still get a lot of publicity, but it seems that a lot of it now is single-family residential, but there is a lot of mixed-use residential going on. Jason: Yeah. Part of Norton Commons starting probably 20 years ago is they had to rewrite the code, because there was no code for a development like this in Jefferson County. There is part of Norton Commons that’s in Oldham County. We have not gotten to that yet, so that’s probably a few years down the road, a little bit larger lots. The mixed-use or live/works are a great concept, to where you can have your business on the first floor and your residence upstairs. Theoretically, we reference the bed-and-breakfast, the innkeeper lives on site. She lives upstairs, comes down and takes care of the guests, and goes back and goes to sleep. Several businesses do choose to operate their business on the first floor and live above it, so it’s quite a neat concept. Greg: Okay. Then I think, driving, I saw some rentals and there are some condos. It really seems like Norton Commons has … between the restaurants and the businesses and the health clubs and the doctors and the lawyers, there’s something for everyone out here. Jason: There really is. I mean, there’s Mexican, there’s American, there’s Chinese, you name the food, you name the doctor, dermatologist, it’s here, and it’s only going to get larger. We’ve just completed one village, the South Village in Norton Commons, which is where the Town Center is. They’ve moved on to the North Village, that’s where the Homearama was in 2016. Probably within the next few years, they will start developing another town center that will probably be a little bit smaller than what we have here in the South Village, but again will give an opportunity for those people moving into the North Village to maybe relocate their businesses to that part of town. Greg: Wonderful. Well, I will be checking in, and please keep us up to date on what’s going on in Norton Commons. For all the people reading or listening, there are going to be pictures as always at ArtisanSignatureHomes.com, and why don’t you tell us … you’re pretty big on Instagram, right? Jason: Yeah, so if you just go and look for Artisan Signature Homes, or @ArtisanSignatureHomes, we’re posting daily. We’re doing some stories with some background information on some of the builds we’re doing, and really a great way to see what’s happening in Norton Commons. Greg: Actually it’s a great way for people if they have questions, right? They can just slip them there in the comments, and reach out, talk to Jason. Who knows, maybe we’ll do a podcast episode about your question. Jason: There we go. Sounds good. Thanks, Greg. Thank you for joining us on this episode of the Louisville Custom Home Builder podcast. If you’re looking to build a home and would like to reach out to Jason with any questions about the process, or maybe just your individual needs and desires, please visit the website at ArtisanSignatureHomes.com. We appreciate your time with us today, and look forward to bringing you another episode next week.